The Andersons Rail Terminal in Anselmo, Nebraska is just one of the many agribusiness facilities nationwide where SKS Engineers has provided professional engineering services. Their new 4-million-bushel rail terminal outside of Anselmo, NE features 2 million bushels of upright storage, a 2-million-bushel ground pile, and 8,000-foot loop track running off of a Burlington Northern Santa Fe main line. Primary storage at Anselmo consists of four Chief Titan 513,227-bushel corrugated steel tanks standing 105 feet in diameter, 60 feet tall at the eaves, and 90 feet tall at the peak. Each of the four flat-bottom tanks is outfitted with outside stiffeners, 16-inch Springland sweep augers, and 24-cable Rolfes@Boone grain temperature monitoring systems. 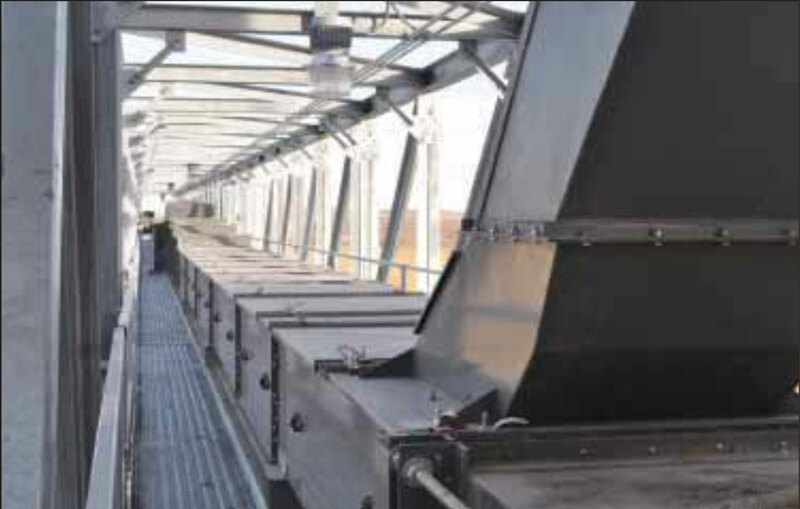 A set of four 15-hp Caldwell centrifugal fans per tank deliver an estimated 1/10 cfm per bushel through in-floor ducting in a quadruple F pattern. 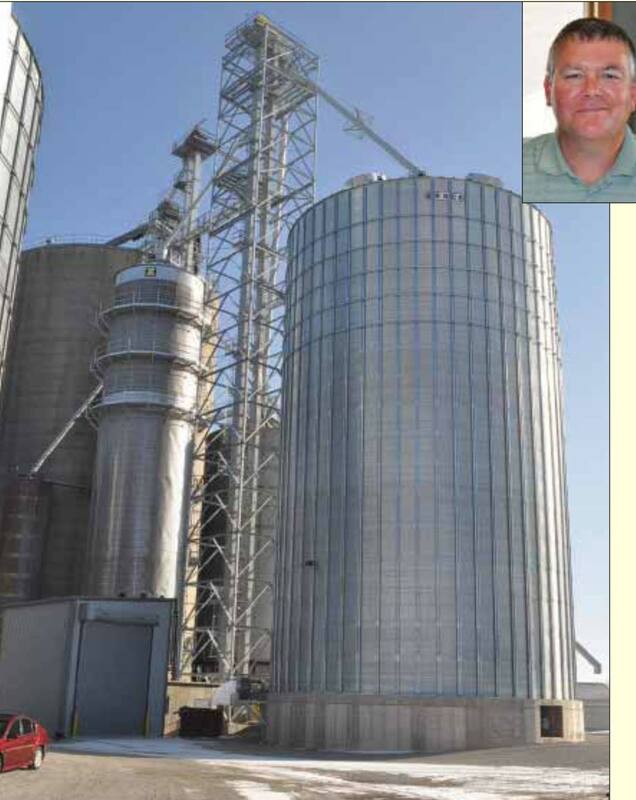 Upright storage also includes a 105,000-bushel wet tank standing 55 feet in diameter, 46 feet tall at the eave, and 61 feet tall at the peak. This tank is outfitted similarly to the larger tanks but with a 6-cable Rolfes@Boone system and two 15-hp Caldwell fans delivering 1/10 cfm per bushel. The facility also features a 2-million bushel LeMar center-fill covered ground pile. The round 305-foot-diameter storage pile has a compacted fly ash floor, 6-foot perforated steel sidewalls, and a center-fill tower topped by four 50-hp AIRLANCO centrifugal fans that draw air up through the pile and hold the tarp in place. Incoming grain trucks are weighed on a 90-foot Rice Lake inbound scale under the control of an Andeweigh scale automation system modified from CompuWeigh software. While on the scale, adjacent to a two-story office building, trucks are sampled with an Intersystems truck probe. Trucks then deliver grain to a pair of 1,000-bushel enclosed receiving pits. The route through the facility is completed as the empty truck is weighed on an outbound 90-foot Rice Lake scale, as the driver receives a scale ticket via a CompuWeigh OTP-4600 outdoor ticket printer, which also features an intercom system with noise cancellation. The mechanical pits feed a pair of Intersystems legs, one rated at 20,000 bph and the other at 32,000 bph, both encased in a Warrior 20-x-20-foot tower outfitted with a switchback staircase. The larger leg is equipped with a double row of Maxi-Lift 18×8 TigerTuff buckets mounted on a 38-1/2-inch belt, while the smaller of the two has a single row of 20×8 TigerTuff buckets. The legs lift grain to a six-hole Hayes & Stolz swing-type triple distributor, which can send grain onto a set of 32,000-bph Hi Roller enclosed belt conveyors running out to storage, to the grain dryer, or direct to the bulkweigher. The 7,500-bph Zimmerman tower dryer is fed from the wet tank via a 7,500-bph Intersystems wet leg and is fired by propane. The dryer empties onto a 12,000-bph Union Iron drag conveyor, which runs to a 32,00-bph Intersystems dry/ receiving leg that returns grain to the distributor. Storage tanks empty onto a series of above-ground Hi Roller 30,000-bph belt conveyors running to a 60,000-bph Intersystems shipping leg. The operator can run grain through a 40,000-bph Interystems gravity screener mounted directly above a 60,000-bph Intersystems triple-garner bulk weigh loadout system, which is under the control of CompuWeigh software. The system includes a railcar tag reader and wheel sensors to ensure the car is properly positioned. Workers atop railcars are protected by a six-railcar-length Fall Protection Systems trolley system. Excerpts from Grain Journal Jan-Feb, 2013, pages 30-33. Photos by Ed Zdrojewski.